We’re giving you one more chance before you’re banned from the page. You’re obviously a fan of pit bulls. 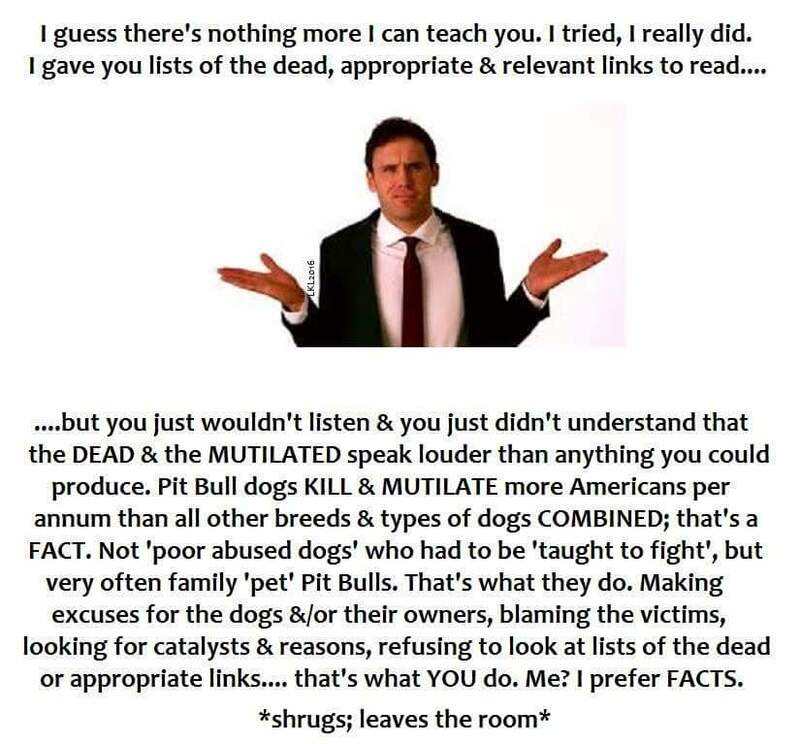 Whether it’s because you’ve been brainwashed by ANY part of the $60 billion dollar per year pet care and supply industry into thinking these dogs were anything BUT purposely bred by human beings for centuries FOR the purpose of dogfighting, or you’re just going to give us more anecdotal evidence because “my pit bull is sweet and I’ve only had good experiences with them,” you choose to defend the one breed type that kills, maims and mauls more humans and animals than all dog breed types combined. The admins of this page have also had good experiences with pit bulls, until the day we did not. You have just commented on one of our pages created by formerly “ignorant” and “uneducated” victims, their families, friends, supporters and former pit bull owners LIKE YOURSELF. We have created these pages in an attempt to spare other families and friends of the pain and suffering we have had to endure by giving you HONEST information. Not DISHONEST information from the countless organizations and TV shows whom are OWNED, CONTROLLED, or FUNDED by dog breeders, owners, veterinarian or animal welfare groups that have a vested interest in keeping the status of pit bulls unregulated, but HONEST information from people that have nothing to gain from this position. We also understand that in sharing this HONEST information about pit bulls, we will be attacked and ridiculed by the “ignorant” defenders of this breed type like you. It is not the “ignorant,” but “willfully ignorant” that is the reason these types of dogs will continue to destroy families for many years to come. Stay with me here. 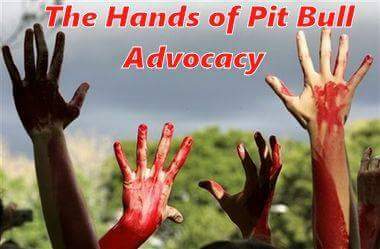 We believe in giving someone the chance to absorb this HONEST information in an ocean of DISHONEST information about pit bulls on the internet and TV, which is why we will give you ONE more comment before we ban you from this page. Frankly, we don’t have time to waste on the “willfully ignorant” anymore. There are plenty of fence sitters out there that are willing to at least READ the information we’re providing. This entry was posted in Uncategorized and tagged bsl, fatal pit bull attack, pit bull advocates, pit bull attack. Bookmark the permalink. Willful ignorance exactly describes it. I lost a friend after I told her NOT to have a recently rescued APBT around her grandkids, sending her an email with links to plenty of information and evidence which she didn’t even bother to read, instead calling ME an ‘animal hater’. Pit advocates just aren’t right in the head. There is no getting through to these people, sometimes even after they themselves have been mauled. As much as its a pity your child got mauled. Look in the mirror you moron. Its your fault. You left an animal alone with your child. Many own pitbulls that they have around children their entire lives with no issue. Its YOUR fault. Ban me all you want. You’re jusy looking or grasping rather for an excuse for you owning an animal you don’t have the capacity to own. YOUR FAULT. Not the dogs. It’s obvious you didn’t read what happened to my son. Typical pit bull advocate. Oh…they love their dogs…they should be banned from our country. Other countries do it. Mine scared me so I got rid of her…she never showed any aggression towards me and was actually quite affectionate. Just when she would yawn I’d cringe .my normal dogs are Labrador retrievers. I would never downplay an attack by blaming the victim. Any dog that kills/attacks should instantly be killed themselves. I’m against what I call, “blind and frivolous pit bull advocacy.” I hate those usual arguments. It’s not how they’re raised. It’s bred in them to not show aggression. It’s bred into them to not recognize submissive behavior. Plus, how come dogs rescued from severe abuse or neglect situations, a lot of times end up living their lives totally fine. If it was how they were raises, they’d be monsters with no chance of living a normal life. On Father’s Day, another tirade unfolded on Jeff’s timeline. In this case, the “So sorry for your loss … BUT” post related to the perfect dog owner concept or what DogsBite calls the “zero margin of error” rule for pit bull owners. If only Susan had “exactly” followed the rules set forth by the boy’s parents, Dax would still be alive. Susan was imperfect on March 6th and broke the “zero margin of error” rule for pit bull owners by carrying Dax outside while letting the dogs into the run. I support BSL and am thankful that it exists where I live. 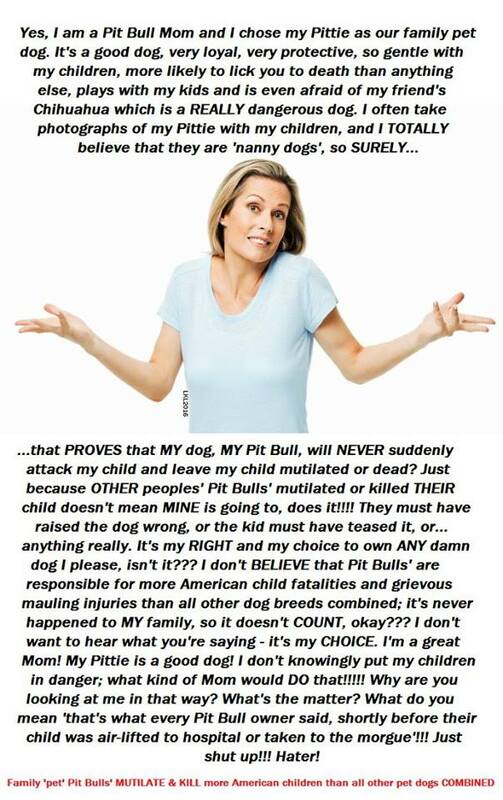 I have had numerous arguments concerning the American pit bull / Staffordshire bull terrier breed. The account of your son’s passing is heart wrenching. I am very sorry for your loss. The psychology of those who advocate for the breed is akin to fanaticism; “fanatics are people who indulge in a heady, intoxicating and toxic concoction of self-affirming, know-it-all confidence that they have unique access to absolute truths, truths so perfect that they have to impose them on everyone.” ~ Jeremy E Sherman Ph.D.
Lmao I cannot believe your list of comments you will be banned for!!! Why, because they are the actual truth and they prove you are uneducated still??!! Then yours are ONLY backed up by YOU!!!! The only links they have to be “facts” are only published to your own site. I feel so bad for the many people on here that you are trying to scare so they follow your pit bulls and bully breeds must die cult, because they can’t think for themselves! Find ANYTHING on the NCRC’S website or related documents that does not cite themselves in their “peer reviewed” data. It honestly sounds like you have no interest in the argument at all other than advocating for the death of the animal to retaliate at for you’re son’s death, to which I am sorry for your loss. There’s no but’s, if’s or and’s. There is only this, pitbuls are not an aggressive breed. However, there are many whom have been raised aggressive because of dog fighting rinks and other outrageous acts. What I wanted to say to you is this, the only way you’re going to get people to listen to your message is if you don’t first insult them, because that will only keep them away from you and stop listening.